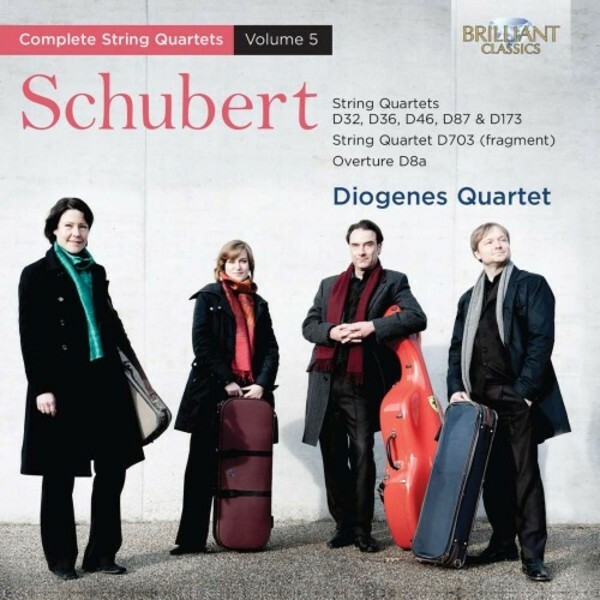 This new instalment of Schubert’s Complete String Quartets by the German Diogenes Quartet contains his early quartets, from the youthful Overture D8a to the C minor Quartettsatz. Comparing the early works with Schubert’s 'late' and mature quartets may find the earlier compositions lacking in profundity, but judged by themselves they are delightful works, in the spirit of Haydn, tinged here and there with Schubert’s melancholy and deep romantic feelings of love and death. The Schubert cycle by the German Quartet Diogenes Quartet is highly regarded - critics praise their superb unity of ensemble and style, their impeccable intonation and their fiery and passionate music making. Excellent liner notes in both English and German.